Is your closet a disaster? Do you have trouble finding anything in it? Have you run out of places to store things in your closet? If you answered yes to any of these questions then consider designing and building your own custom closet. A custom closet design creates order out of chaos! 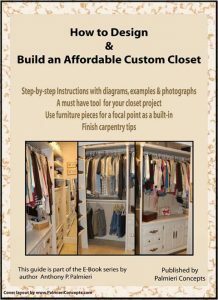 The “How to Design and Build a Custom Closet” Ebook provides easy to understand, step-by-step instructions, on how to design and build your own custom closet. Pictures are included for every key step in the process! Order Now and Immediately Download the How to Design and Build a Custom Closet EBook today! The How to Design and Build a Custom EBook costs only $15 and is 100% guaranteed. The How to Design and Build a Custom Closet EBook costs only $15 and is 100% guaranteed.